Standard fare as far as packaging goes, but what draws the eyes to this figure is the sheer number of accessories featured in the blister window (more on that later). 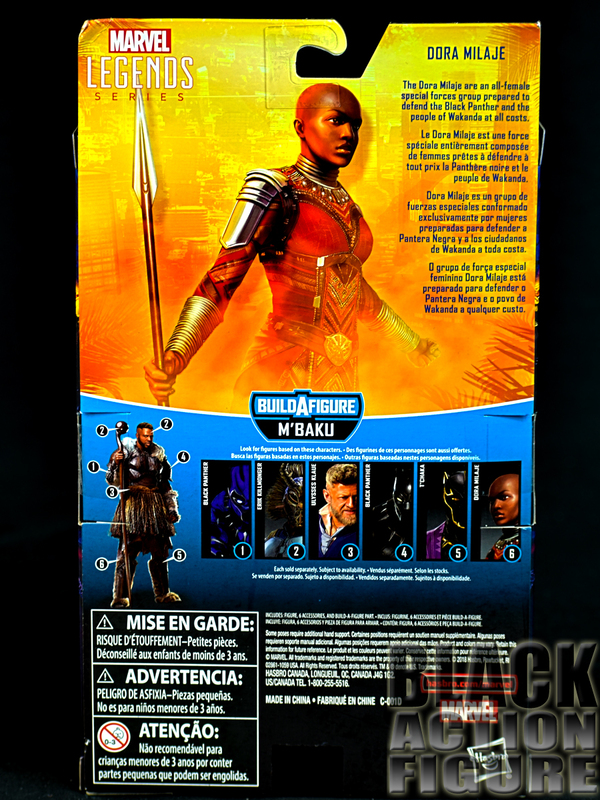 Just like other newer figures, the back features “artwork” of the character rather than a promo shot of the figure itself. 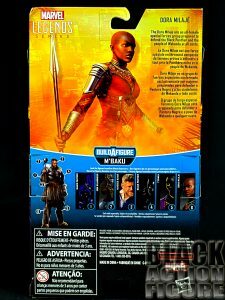 I wonder if Hasbro just caught on that their prototype promo figures that they used to feature on the back sometimes looked a hell of a lot better than what you were getting? If so, they definitely caught on and made the change. 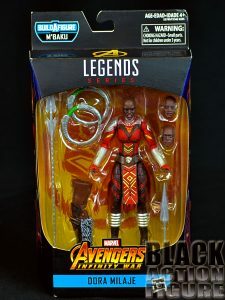 One thing I did notice is that the top of the box features the “A” for Avengers meaning that this figure is in direct relation to that movie. 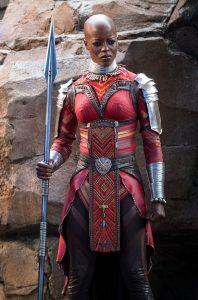 I would have rather have seen the Black Panther logo instead. But whatever gets the figure into our hands. I couldn’t believe how many accessories they decided to include with this figure. 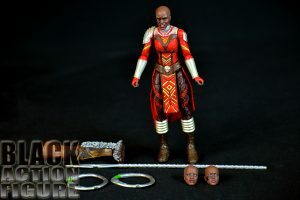 Build-A-Figure piece aside (M’Baku leg), you get the Dora Milaje figure, 2 additional replacement heads, a spear, a short sword, and two ring weapons. 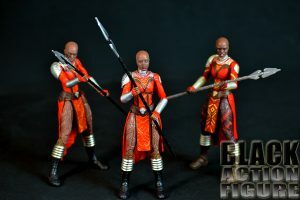 The weapons themselves are repainted versions of the weapons that came with the Nakia figure and the Okoye Build-A-Figure, but it was a smart move to include the variety. While I ultimately posed them all with spears (see picture), I should have taken the opportunity to outfit them all with the other different weapons made available. The heads were a wonderful addition. 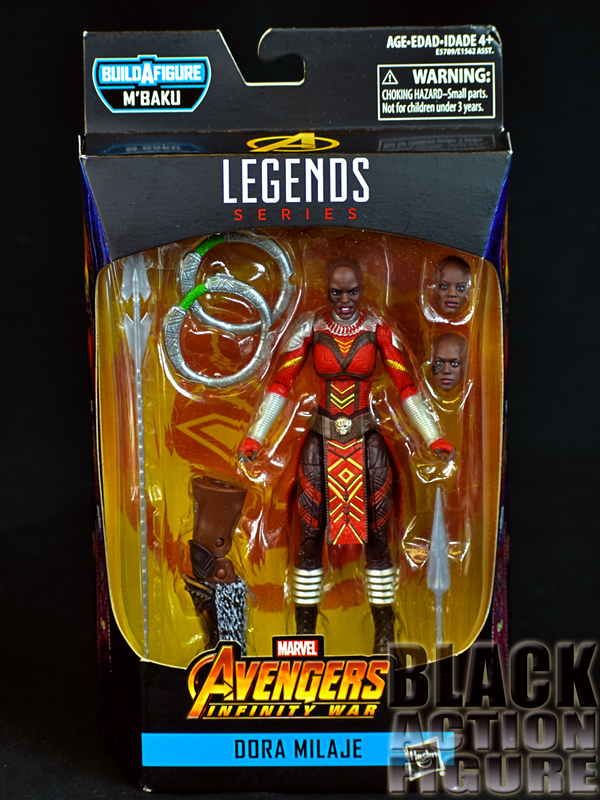 On someone’s suggestion, I was able to purchase two additional Nakia figures for about $10 each during the holidays and have used that body for the other two heads. So almost an instant 3 figure army with just a couple of purchases. I was extremely happy to pull that trigger. All in all, little to no complaints whatsoever with what Hasbro has managed to include in the box. 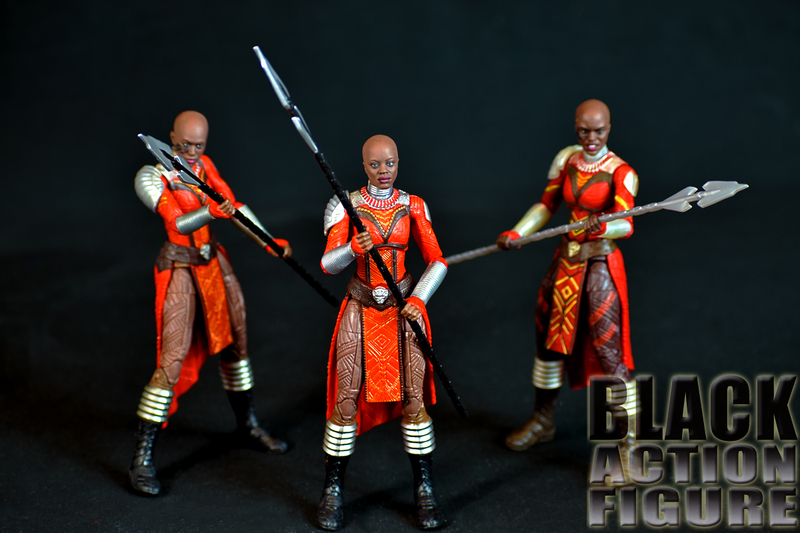 One of the heads was based on the Dora Milaje, Ayo, a recurring character in the Marvel movies. On multiple viewings, I was actually surprised how many times Ayo shows up in the background, protecting her king. I say all that to say that I will be using this iteration of the figure for the Sculpt/Likeness. 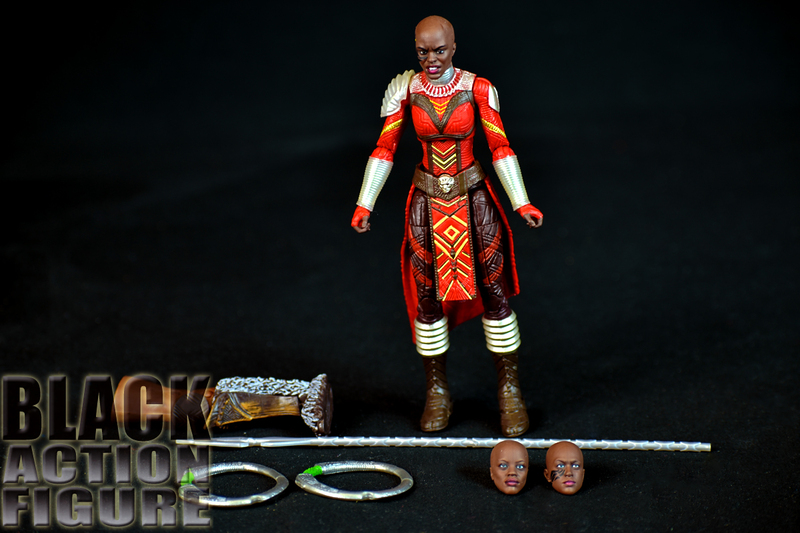 The body on the main Dora Milaje figure is a repaint of the body that came with Nakia. It actually has some more intricate details and colors that did not come with Nakia. 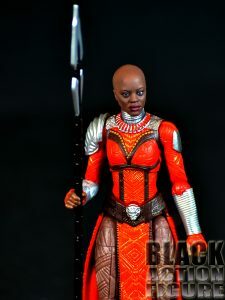 Other than a color scheme change, this figure is exactly the same as the Nakia body and I celebrate them adding the paint accents on the figure body. The “Ayo” head is remarkable. I really can’t believe some of the work that Hasbro is putting out right now, especially with this “face match” technology that they have. Great work! 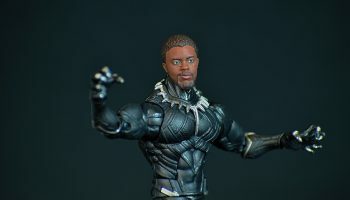 The sculpt even catches some shadows in the face the same way the real person does. Since this is an army builder, I can’t hold accuracy on the same scale as I would another figure. The outfit does seem like it is the wrong shade of red. But overall, happy with the product. 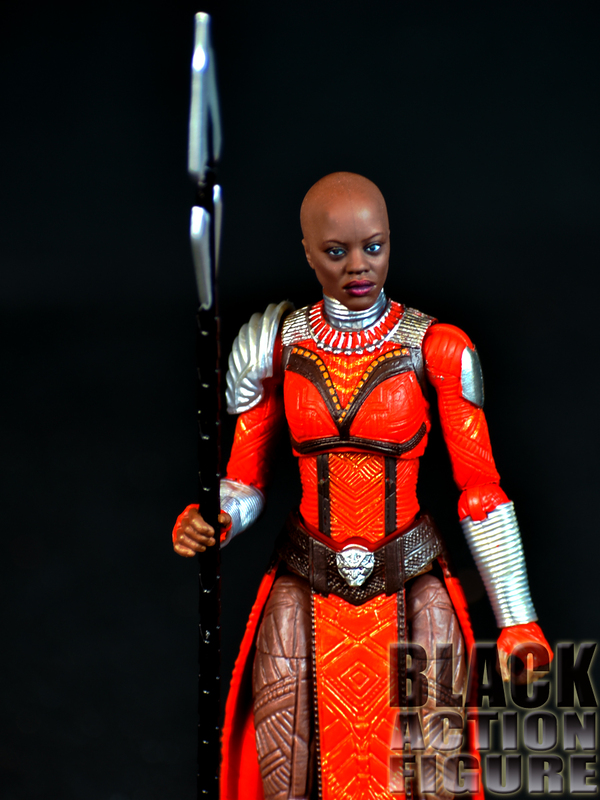 Seeing that the body is actually a reused Nakia, it stands to reason that the articulation is exactly the same. 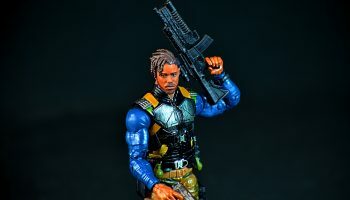 This figure comes with 28+ points of articulation. Right off, noticeably missing is any type of waist articulation. It would have been nice if that was added in. Other than that, the rest of the articulation makes posing the figure with the bajillion weapons fun. 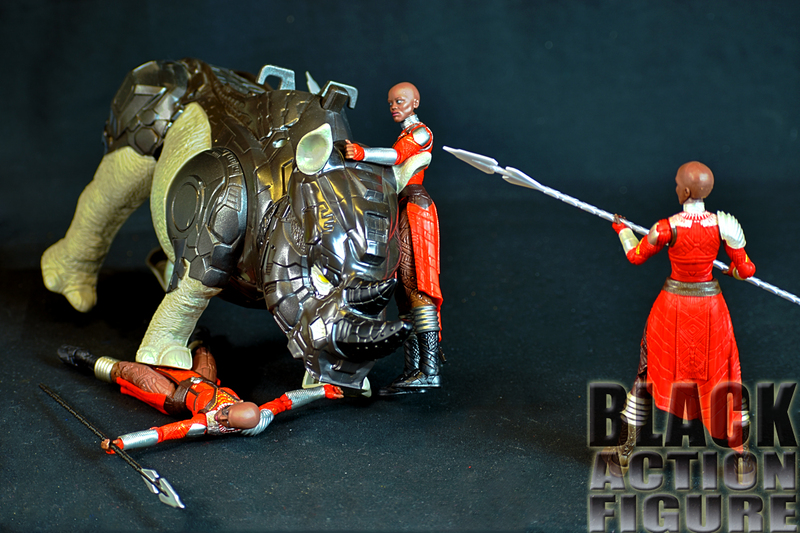 I’m still in awe that one of my top requests from Hasbro has actually come through. 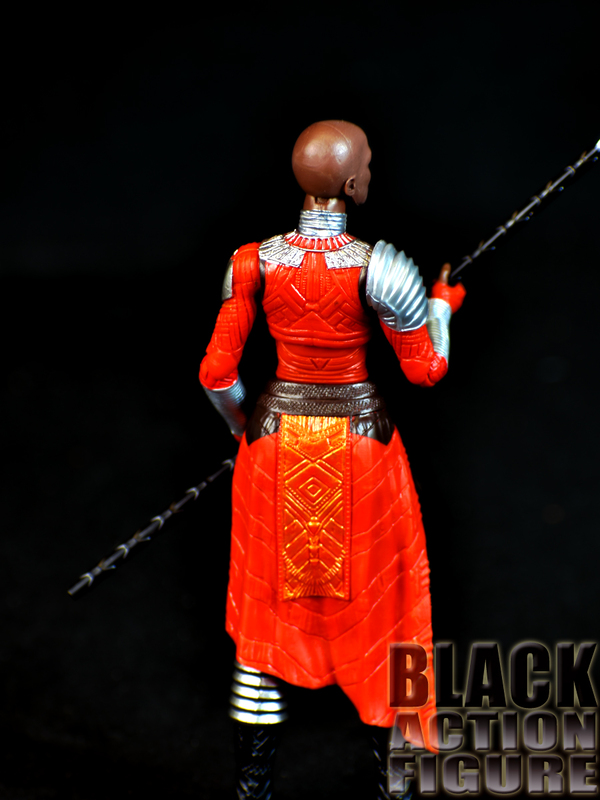 I really have to start wishing on that Blue Marvel figure hard…that may be next! 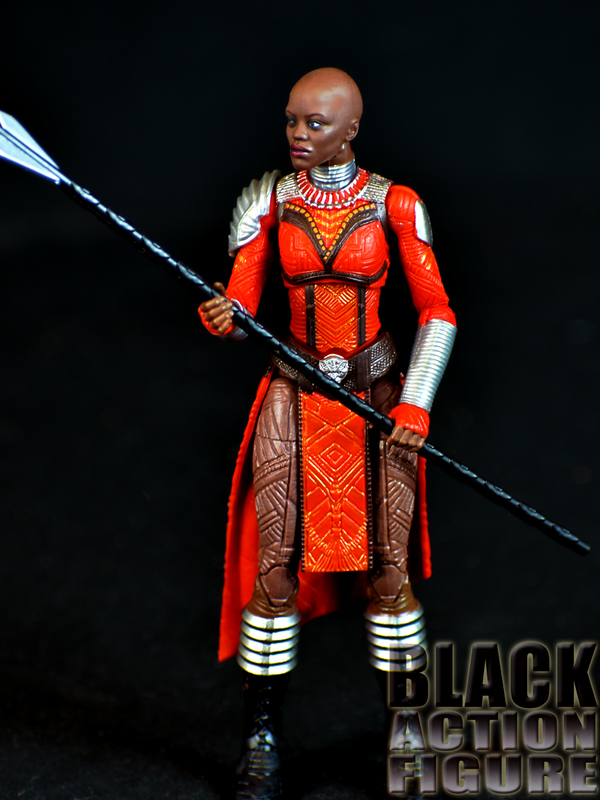 As of this writing, the Dora Milaje figure is down to $16+ on Amazon right now. While a nice price point, just wait until this figure hits around the $10-$12 price point. 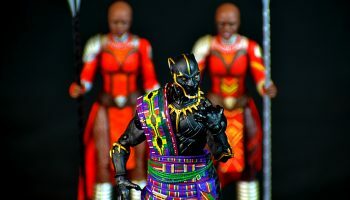 I will be buying these figures left and right then.